Last July, at the height of the visible racial unrest in the United States, my husband Kyle preached a sermon about the very real problem, in light of who God is and what his gospel says, of racial division in our nation. In it he voiced the words I'd been whispering to myself and praying to God: "I want to do something, but I don't know what to do." I'd written about it on my blog, and I'd had a few conversations with African-American women online and in my personal life where I asked questions and listened, but I generally felt helpless. There was a girl at church that day, sitting near the front. Her name is Macy. After church, she said to Kyle, "I want to do something." She wanted, she said, to partner with someone in our community who is working toward racial unity. Kyle said, "I don't know who that is or what is already happening, but I do have the card on my desk of an African-American pastor I recently met. Why don't you call him?" So she did. This little firecracker of a girl made an appointment with Pastor Lehman Bates at Ebenezer Baptist Church, a 125-year-old church in the heart of our town, and said to him, "Whatever you're doing, I want in." This is where I need to stop and tell you about where I live. I live in Charlottesville, Virginia. Most people don't know where that is or anything at all about our city, so I don't blame you for your blank stare. Charlottesville is in the mountains of central Virginia and, for its relatively small size, stars in much of our nation's history. Charlottesville was touched by both the Revolutionary War and the Civil War. Three U.S. Presidents built their homes here: James Madison, James Monroe, and Thomas Jefferson. As the writer of the Declaration of Independence, Thomas Jefferson certainly stands out; he is our most famous citizen and continues to loom large over our town. The elite public school he founded, the University of Virginia, thrives still today. His home, Monticello, sits atop a mountain overlooking the city and draws thousands of visitors each year, where they hear about his ideas and his genius. At the local bookstores, one can purchase The Jefferson Bible, the Bible with the miracles removed, just as he thought it should be. This is the history everyone talks about. I've been to all the president's homes, traipsed around the courthouse where Jefferson practiced law, and read books about Lewis and Clark's expedition from Charlottesville. I've toured UVA and viewed Edgar Allan Poe's dorm room on the Lawn. I can tell you the history of this place. Or at least I thought I could. I can also tell you the general history of the churches in our community. I can tell you about how Vacation Bible School started at First Baptist Charlottesville and how Lottie Moon was saved and sent out from there and how the founder of Southern Seminary pastored there. I can tell you about the founding of the large Presbyterian church and about the church plants who came before and after us. I can tell you the church history of this place. Or at least I thought I could. There in the heart of our city is Ebenezer Baptist Church, and I didn't even know it was there, much less that it's been there for 125 years. 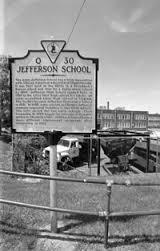 It sits behind the Jefferson School, a building that used to house a segregated school for black children. And from its door step, one could look up toward the mountain where Monticello sits and imagine the slaves that once lived there, owned by Thomas Jefferson himself. It seems there is a lot of history we don't like to talk about. And so little firecracker Macy found herself across the desk from Pastor Lehman Bates, and after their conversation, he said, "How did you get my name?" She said, "My pastor. He just preached a sermon on racial division, and he gave me your name." Pastor Bates didn't remember meeting Kyle, didn't remember giving Kyle his card, and didn't recall having heard the name of our church. He later said, "I knew the Lord had called me to answer every email or phone call that came my way from people wanting to talk about racial unity. Most never amount to anything, but my job is to answer every single time." So little firecracker Macy started a fire because the Holy Spirit was a fire in her, and the Holy Spirit was a fire in Pastor Bates, and the Holy Spirit was a fire in Kyle. Pastor Bates called Kyle and they got together to talk. Pastor Bates said, "I hear you preached a certain sermon, and I want you to preach it at my church." And Kyle said, "Maybe you better listen to it first." So he listened, and we were still invited over, and Pastor Bates was invited into our home and our church, and somewhere in there, the Holy Spirit started a fire of partnership and friendship between pastors and pastor's wives and churches and people. The first time I went to Ebenezer, I sat in their sanctuary and listened as their 88-year-old Chairman of deacons, Mr. Page, began the service, and as a little girl, probably about 8 or 9, read Scripture at the microphone like she owned the place. The women in the choir sang so joyfully and so loud, their voices could have filled an arena. We were asked to stand and introduce ourselves, and the church called out greetings of warm welcome. I looked around at their historic building and suddenly thought of how we've lived here all of 9 years, and how our church is a baby, and how faithful people have been tilling soil in Charlottesville long before us. Kyle was there to preach, but we were really there to listen and learn. We were there to extend and receive friendship. Afterward, Mr. Page showed me the baptismal where he was baptized as a child, and I met a woman whose mother was the first black teacher to desegregate a local elementary school. I thought about all the history of Charlottesville I thought I knew and how, really, I had so much still to learn. I'd driven past buildings and schools for years and had not known their histories. Worse, I'd walked past people for years and not really seen them. My own short-sightedness and ignorance had kept me from seeing beauty, and I'd missed the bigger picture of what God was doing in our community. To be invited so warmly into a sacred space was pure grace. The Holy Spirit is meeting the prayer in my heart with fire and water. That's what it feels like. The story is just beginning, but it feels like a fire has been lit, and I want to protect it so it doesn't flame out. However, I get a strong sense that this is a fire that God is protecting and even fanning. And that's why it also feels like water, because we're all simply riding a wave of something God is doing. He's taken our little boats of boldness and thrown us into a current. He's up to something, building a partnership in our community to meet needs together and serve together and worship together and, I plead in prayer, to show the love of Christ to our city together. His work has only just begun. He's up to something, and I'm just trying to take it all in. I'm trying to learn the full history of this town. I'm trying to ask questions, even the awkward and uncomfortable ones. I'm trying to see things to which I've never paid attention. I'm trying to ride this current as far as God takes me. Friends, there is so much to this story that I have had trouble putting it into words, but this is why I wanted to tell it: I want to encourage you to follow the Holy Spirit's leading in your life. If you have a prayer on your lips for racial unity, ask God to illuminate the path for you to walk toward real people in your everyday life. Learn the full history of your city. The Holy Spirit makes us bold, as He did Macy, Pastor Bates, and Kyle. He also humbles us and helps us love and listen, however imperfectly. I hope you'll pray today and ask God for boldness, as well as a tangible direction for that boldness. Will you also pray for us as we seek to love and serve one another here in Charlottesville? Pray for Ebenezer and for Pastor Bates and the work they're doing in our city, as well as my husband and our church. May God write a beautiful story with each of us.